Dani Pedrosa has launched a scathing attack on the decision to introduce a new softer construction Bridgestone front tyre from the British Grand Prix onwards. Pedrosa and Repsol Honda team-mate Casey Stoner are the only two struggling to make the new softer front tyre work having encountered an issue with braking stability. A limited number of the new front tyre was made available for the Jerez, Estoril, Le Mans and Catalunya rounds but it will be the only spec available from Silverstone onwards. The move has infuriated Pedrosa, who voiced his anger after testing the new softer construction front tyre again yesterday at Catalunya. The Spaniard branded the decision ‘unsafe and unfair’ and hit out at Dorna for agreeing to implement the mid-season switch when nobody had complained about the performance or safety of the older spec front. 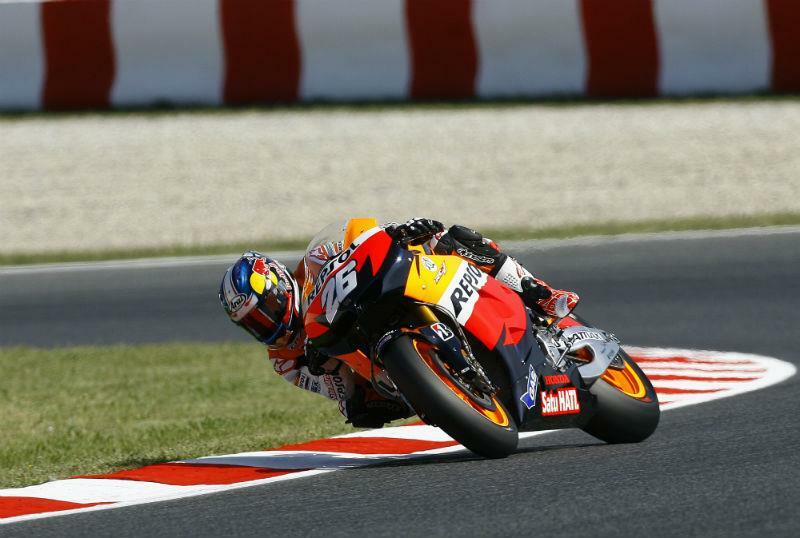 Pedrosa said he was making his views on the tyre change clear to ‘Bridgestone and the organisers’ and that he agreed with Stoner’s recent criticism of the MotoGP world championship. One of the prime reasons Stoner is retiring at the end of 2012 is because the Australian is fed-up of constant tampering with the rules. With none of the new spec front tyres available to test tomorrow at the Motorland Aragon track, HRC has decided not to attend.